Drinking mead for Wren Faire and a giveaway! Check out my new dress! Wren, if you don't know, is Colette Patterns latest knit sewing pattern which was released a little over a week ago. The fun folks over there decided to have a sewing contest and name it Wren Faire. I'm cracking myself up thinking about Renaissance Fairs and the idea of drinking mead in honor of Wren Faire hahahaha. I daydreamed about taking photos of myself in the dress at Tooth and Nail Winery in Paso Robles (it looks like a castle and has a MOAT! ), holding a turkey leg, and chugging some mead. But in reality I wouldn't get to the winery before sunset, I don't eat birds, and where does one buy mead anyways? I wish I could say that sewing this was a piece of cake, but it was not. It wasn't due to faulty instructions or pattern pieces, it was due to my machine being a total jerk. I noticed it acting weird on my last few sewing projects and figured I'd take it to get serviced in a couple of weeks. It was not happy with sewing anything despite the different threads and needles used. The thread shredded constantly, so I didn't use a twin needle for hemming or along the front of the bodice and zig zagged everything instead. Even if I wanted to stretch the elastic as I sewed along the waistline it wasn't going to happen. My machine wouldn't gather the elastic at all, so I basted three rows of stitches and gathered it by hand before attaching the elastic. The pattern is not a difficult one to understand or sew, but when your Pfaff hates you it doesn't make for the best day of your life. I KNOW that my next version will be a million times faster once my machine goes to the doctor. Very few adjustments were made to Wren and considering this is a wearable muslin (I normally swear by muslins, but didn't have the time to make one. Living on the edge I guess.) I am pleased with the outcome. My shoulders are narrow, so I graded from a smaller size at the shoulders to the next size up at the waist and other than that I didn't make any changes. For the next one I will probably shorten the waist a bit, but honestly I am really happy with the dress as is. I feel great wearing it and that's what is important, right? Now let's talk construction. The ruching effect near the shoulders is made with basting stitches which are then gathered and add the prettiest touch to the pattern IMO. 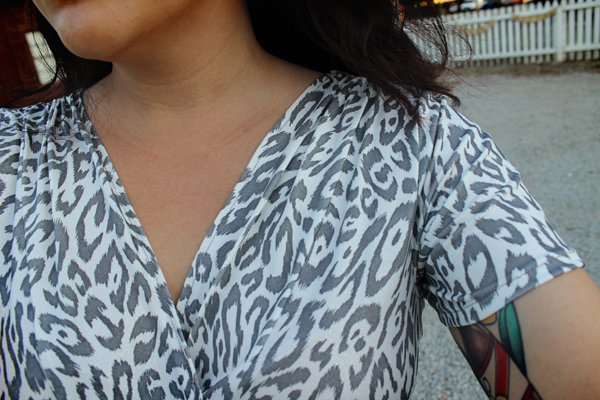 My wild print really doesn't do it justice, but on a solid fabric the gathers would look beautiful and really shine. When it came to the gathers along the waist I wasn't a fan of the directions included and prefer the "gather first" tutorial here. I haven't ever had much success with the "stretch as you sew method" because my gathers don't look as good as doing it by hand. It's not to say that one method is better than the other, it's just a matter of preference. 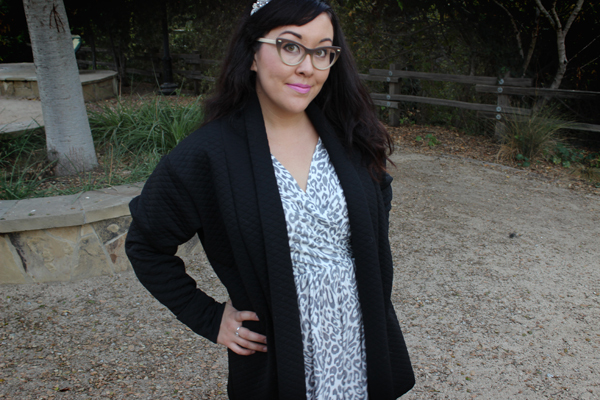 An unblogged Seamwork Oslo cardigan sewn in a quilted black sweater knit from Michael Levine. When I find a good pattern I like making it over and over and I have found that success with Colette's knit patterns. Wren is no exception, so expect to see more versions in my future. Love that dress on you. Perfect. My sewing tip is for knotting the thread when hand sewing. Make a loop as if to knot. Place the thread through loop and make another loop. Tighten the 1st loop. When you sew through and pull the 2nd loop the knot is small and secure. Never comes undone. I adore your dress. I'm a knitter but am wanting to learn to sew dresses to go with them.My book recommendation would be Ferociously Happy. It's a great book and who couldn't use a laugh.. If you haven't yet, you should read "All the Light We Cannot See"! Looks great, I'm bucking the trend and going with a book - The Pilgrim, spy-ish and long, a fab read that absorbs for a while! Book recommendation: I'm on a 'Dressmaker' kick. My library system had four authors with dressmaker in the title. My favorite of the four is by Gayle Tzemach Lennon : 'The Dressmaker of Khair Khana'. Two were fluff pieces (one will be a movie), two actually had sewing inside their pages. This last one is from Afghanistan during the Taliban takeover when women could not leave their homes except inside a chadra (sp?) with a male relative in tow. My favorite tip is to use a walking foot. I sew knits with my straight only stitch sewing machine, so the only method that works is stretching the fabric slightly while i sew. 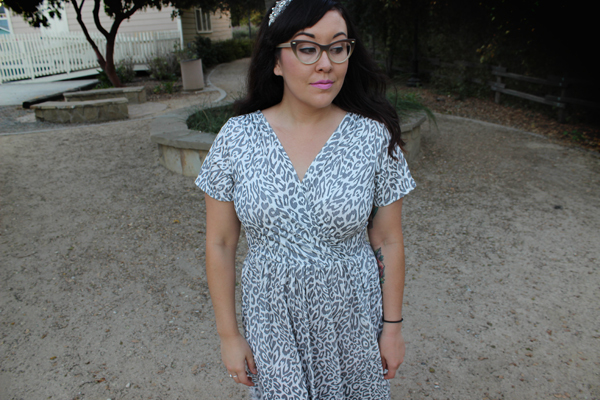 Love your dress, the print is beautiful, and the gathered neckline looks sophisticated! A lovely dress! I love all books Alexander McCall Smith. 44 Scotland St. and Isabelle Dalhousie especially. Enjoy!